Pryce High is a video game idea I've had for some time in the back of my mind that I felt would be a good accomplishment with the proper support. Essentially, my idea being, what would happen if I took Mitadake High and Pyrce High. Then, I kind of squished them together into a 3D game. Thus, Pryce High would be unveiled. Pryce High would be my idea of a 3D first or third-person hack-and-slash RPG. This thread post is essentially for me to post my ideas. I reserve the right to edit this post at any time to add, remove, or change existing information. Now, let us get down to the business. Mechanics. For example, the player will be able to sprint, as well as jog. Of course, walking normally will take up no energy out of your pool of 1000. It is, however, sometimes, painfully slow. Jogging can be used by holding Left Shift, and the player will move 2x faster than walking. Jogging will eat up 25 energy per second. Sprinting, however, is done by double-tapping Left Shift while moving forwards. It will cause the player to sprint for 5x movement speed until they run out of energy or they stop. Sprinting eats up 100 energy per second. I want this game to be as equally fun for RP as it is for PVP. As well as everything in between. I want the combat mechanics to be fun. Consisting of various weaponry types. Each doing their own style of damage, and have their own uses. With, say, a billhook, one would be able to swing in various directions. By left-clicking their mouse, and swinging their mouse to the right, they would, in turn, swing their weapon to the right. The animation has a horizontal strike path, where anything in the strike path gets hit. This works in any direction. Left, will make a horizontal slice in the opposite direction. For weapons that support it, thrusting your mouse forward during an attack would cause the player to do a downward vertical cleave. This is dealt for 1.5x damage, but is slower than an average attack. Similarly, for weapons that support it, pulling your mouse backwards during an attack will cause the player to do a stabbing attack. This is slower than average attacks, but deals 1.5x damage. Some weapons to not support these features. Possibly, I plan to implement blocking as a vital function. If you're in combat, and your weapon supports blocking, you can block a directional attack by pressing the bound key. By default, that key will be your right mouse button. While holding the mouse button, you will block incoming attacks. On harder difficulty styles, you may have to block directionally. This means, if the enemy you are facing swings to your left, you will have to move your block to the left in order to properly block it. The player will also be able to partake in combination attacks, or "combos." For example, by swinging your weapon to the right, you will strike your target, dealing damage normally. Than, you can SPIN your mouse in the same direction you swing in. Upon spinning 360 degrees, this will cause you to do a combo attack. Combo attacks can be done once upon a successful hit, and will deal an additional 1.5x weapon damage to the target very quickly. You cannot use combos with attacks that were blocked. Nor is it worth the trouble for some weapons, because a combo may leave you vulnerable for a short time. All these aspects will work equally in third-person as they will in first-person. The player will be able to seamlessly change between the two styles of gameplay as they so wish. Alongside third-person, a second first-person style will be available for use. This is mostly for role-play reasons. By default, double-tapping left alt, you can toggle look-mode on and off. This will make it so you can look around the scene without turning your character's body. Additionally, in stead of strafing with your left and right movement keys, those keys would now turn your character left and right. the game will be immersive with Voip (voice over IP) chat and text chat alike. So, should the players wish to immerse their RP through voice chat, they can do so. Pressing , (comma) or . (period), you can change through the menu in which your voice communication works. Being able to choose between Say, Emote, Shout, Whisper, and, for watchers, Watcher-chat. Text Chatters will also have equal abilities. If the Emote style is selected, only text chat will use it. Any voice chat will simply revert to Say. How about some Heads-up-Display elements? I thought about this for a while, and I decided I didn't want an HP system. Hit-points are too old-school. Let us try something a little creative in stead of losing HP upon a hit. In stead, I decided to add blood. Blood is a great system because, you can use it universally for anything dealing with your character realistically. The players will start with 10000 (Ten thousand) blood. Blood can be lost through various means. Weapon attacks, bleeding effects, and more. When a player's blood reaches 0, they die. I suspect blood will appear as such on the hud. Equally, slashing weapons will cause blood loss more than any other weapon in the game. This includes knives, billhooks, and many more weapons. Slashing weapons are also most likely to cause bleeding while the victim's chest is damaged. Bleeding, when it occurs, will happen in the limb that is struck. If you are struck in your arm when you bleed, your arm will begin bleeding, thus, applying a bandage to your arm will solve the issue. However, applying the bandage to your leg will not solve the bleeding in your arm. Silly! While bleeding, the player will slowly lose blood. Depending on how bad the wound is. They will also consistently leave a trail of blood on the floor where they walk. This can then be tracked by their assailant. Any weapon that does any damage can break limbs. Some take longer than others. For example, you can break a leg with three hits from a metallic baseball bat. This is what I will use to give the proper example. One hit from a metal baseball bat will deal substantial enough damage to make the limb yellow. A yellow limb means the limb is hurt. Hurt limbs deal minor debuffs to the victim, depending on what limb is hurt. I will provide a varied list of debuffs at the end of this. Two hits from a metal baseball bat will cause the limb in question to turn orange. An orange limb means the limb is injured. 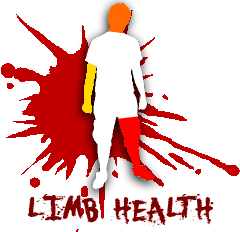 Injured limbs are the second stage of limb health damage and will cause worse debuffs than hurt limbs. Three hits from a metal baseball bat will cause the limb to turn red. A red limb means the limb is broken and can no longer be used. Broken limbs deal the worst debuffs to players and can only be repaired with splints and bandages. Chest: 10% more likely to bleed from slashing weapons. 5% more energy usage per second. Legs: 5% slower movement speed. Two hurt legs will stack to a 15% movement speed reduction. Arms: 5% slower weapon swing speed. Two hurt arms will stack to a 15% swing speed reduction. Head: Anything that takes time to do will be 25% slower. Chest: 20% more likely to bleed from slashing weapons. 15% more energy usage per second. Legs: 10% slower movement speed. Two injured legs will stack to a 30% movement speed reduction. Arms: 10% slower weapon swing speed. Two injured arms will stack to a 30% swing speed reduction. Head: Anything that takes time to do will be 50% slower. Chest: 50% more likely to bleed from slashing weapons. 25% more energy usage per second. Legs: 30% movement speed reduction, player cannot sprint. Two broken legs will take away the player's ability to jog, but the movement speed will stay at -30%. Arms: 30% weapon swing reduction, two-handed weapons swing 75% slower. Two broken arms takes away the ability to use combos. Head: Anything that takes time to do is 200% slower. Stacked debuffs will not stack with injuries of other levels. IE: A hurt leg debuff will not stack with an injured leg debuff. This is also applicable to arms. When used in conjunction with Splints, bandages can repair broken limbs. Those limbs can then be applied First Aid to be restored to normal. When used by themselves, bandages can stop bleeding effects on the applied limb, as well as healing that limb for a small amount of damage. Bandages can only be used once before it is consumed, and can only be applied to a single limb. Using bandages takes time, and will require 10 seconds to complete. When used in conjunction with bandages, splints can repair broken limbs. Those limbs can then be applied First Aid to be restored to normal. Splints have no other use at the moment. Repairing broken bones takes time, and will require 25 seconds to complete. First-Aid kits can be used to restore wounded limbs to their former glory. First-Aid Kits cannot be used to repair broken limbs, and trying to do so will simply waste one of your 3 uses. Using a First-Aid kit on a wounded limb will restore that limb to the last level of injury. IE: Using a first-aid kit on an injured limb will change it to hurt. Using the first-aid kit on a hurt limb will change it to normal. First-aid kits can only be used on one limb at a time. They have no other uses at the moment. Repairing a limb with a First-Aid kit takes time, and will take 10 seconds to complete. I was debating about adding these or not, as to not seem too much like a DayZ ripoff. But, I figured, why not at least list it just in case. Blood bags are exactly what they sound like. Bags full of blood. As rare as they are, blood bags are also very useful. They can also be thrown on the floor to simulate spilled blood that is dropped during combat. This consumes the blood bag and is not recommended.If you get a friend to use the blood bag on you, either by using it in their inventory and selecting you, or by you requesting a blood transfusion from them, the friendly player will, then, give you a blood transfusion. Blood transfusions takes time, and will take 25 seconds to complete and restore the targeted player back to 10000 (ten thousand) blood. Syringes are used for what you think they are; Injections. You can use various chemicals in syringes to either heal yourself, or to sedate somebody. Hell, if you wanted to, you could poison them! Syringes must be used in conjunction with a vial of something in order to be useful. When you fill a syringe with something, the syringe becomes 0.25 lb in weight. Additionally, the vial is consumed. Syringes can be used twice, then the player will receive the message "The syringe needle snaps in half!" This is to keep people form farming the same needle all day long. It at least makes sense to me. Developed by Aperture Research Corp, Apertone is a devised substance that re-forms the bodily tissues and repairs wounds. When used in conjunction with a syringe, Apertone will not repair broken limbs, but will instantly restore an injured or hurt limb back to normal. It will also stop bleeding. Apertone-filled syringes can only be injected into certain limbs. You can also inject it into the limbs of your friends. Lucky you! There's enough in the vial for 2 uses! This is reserved for additional information, if necessary.